A town needs its firehouse – be it in a hamlet in the middle of the nation’s Corn Belt, or downtown in a bursting metropolis; a one-truck affair attached to a Quonset hut dorm/kitchen/training room/card parlor, or a ten-bay three-story brick showplace with enough dorm rooms to start a Marriott, a kitchen with a walk-in reefer, classrooms, a dayroom lounge and a truck shop rivaling the Alamo’s. And be it large or small, in Minden or Manhattan, it’ll have a chrome fire hydrant at its entrance. That’s tradition, and few callings have traditions that run as deep as those of the fire service. And the townsfolk embrace their fire departments, and their firefighters. Watch the foot traffic at Raley’s on Mayberry grind to a halt when the door rolls up on Engine #5 across the street, the big motor cranks up, the red and blue lights come on and the engine lumbers down toward Hunter Lake Drive. If the shoppers just watched a moment longer, they’d see the door close itself automatically, for the station’s now vacant. At a Safeway, kids of all ages, some in strollers and others with graying temples pushing those strollers, approach a Sparks “triple,” the one with “Keep Back 343 Feet” on its hose bay – one foot for every firefighter that died at the World Trade Center. With a little luck they can get a tour or a demo or see what’s stored behind the myriad of doors on the sides of the engine. If they’re real lucky – and somewhere in Sparks someone else is real unlucky – they can watch the firefighters, grocery shopping in the store, beat feet back to the truck and tear out of the parking lot. That’s high livin’ – not a similar sight to be seen when the UPS or the Pepsi truck leaves. Fire trucks are special. And the fire stations – what memories every kid has of the first trip to a fire station, with a parent or the school. 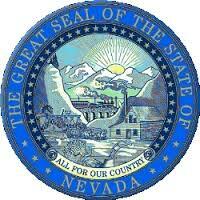 In Reno for most of us reading this it was Reno Main on Commercial Row and West Street, in service ‘til 1976. The firemen – an acceptable term in 1948 – saw the looks on our faces when we rode our bikes up to an open stall. “Wanna come in?” – Yikes, we’re actually in a fire station. 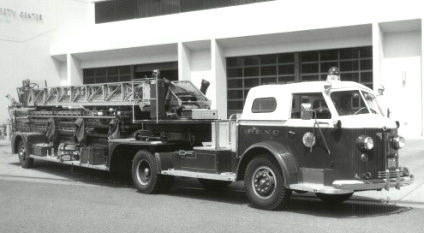 “Go ahead, climb up the ladder,” and we were on the tillerman’s seat of the city’s brand-new American LaFrance hook-and-ladder, an archaic term now [that truck’s pictured above, some 40 years older when the shot was taken]. That new LaFrance rested among a few old pre-WWII warhorses. “This is the alarm board,” Smokey showed us (all firemen were “Smokey” to kids; a popular one in Reno was Smokey Lowe at Station #4 by the Sigma Nu house.) The Gamewell alarm system to coordinate a city’s fire alarm boxes dates back the 19th century and is still in use in some cities, substantially unchanged. Reno’s was a beauty in 1948 – four feet square on a wall with lots of brass and gauges and switches. Self-reliant, the wet-cell batteries to operate it gave off an aroma we eight-year-olds had never endured. Reno’s Gamewell board was preserved and relocated to the museum in the now-endangered [gone] main station on East Second and Evans. We went upstairs to the dorms and dayroom. “How does that firepole work?” we asked. Duuhh. “You stand right about here,” Smokey said, leading us to the hole looking down into the apparatus bay. “Then you put your arm around the pole, but don’t let your skin touch it. It’ll burn.” We locked our arms around it, but didn’t touch the pole. “You’re not allowed to go down the pole. Only firemen can do that.” Then, “Lean a little closer.” In turn, we leaned. Smokey smiled. “But don’t step off the floor or you might slide down the pole.” And we stepped off. Smokey met us at the bottom of the pole. Three boys that 1948 Saturday morning made up their minds to be firemen someday. And, as memory serves, it would only be a few months later that the tougher side of firefighting would be seen by us and most of the rest of Reno: On August 15, 1948 an inferno would rage through Lake Street. We saw the aerial that we’d “steered” and wondered about Smokey. He was OK, but Sparks Fire Department’s Chief Frank Hobson and two Reno firefighters, Captain Glen Davis and Fireman Earl Platt, and two civilians perished that morning. Boys grow tall and have their own sons, and we take them to, yup, a firehouse. The government of a city might take place at a city hall, but the firehouse is ground zero for cool stuff. We take old bikes there for the firefighters to fix for kids at Christmas, and in October we go to one for the Fire Prevention Month Pancake Breakfast. A city needs a big ol’ central firehouse, that a kid can ride his bike up to, with shiny engines and brass poles and a museum full of photos and antique helmets and nozzles, and an old Gamewell board and a Smokey to show ’em around. I guess Reno needed a ballpark worse. I wrote a column about Lew Hymers’ book last weekend; thought you might enjoy seeing a random page scanned from that book. I’ve had a number of inquiries about availability of the book. It’s well out of print and not catalogued in the usual channels; considered a “collectors’ item” it’s being sold on a couple of websites for over $400. There is a 1999 revision of the book available through the University Oral History Program or Sundance, but it’s pricey also and only has about 50 pictures in it, with a lot of narrative. 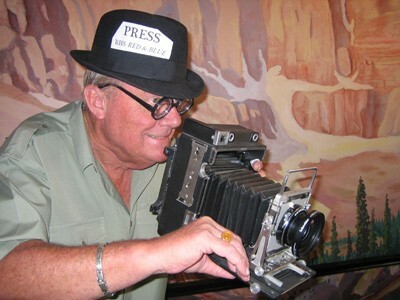 The original may be viewed, I think, at the Nevada Historical Society, noon to four pm Wednesday through Saturday. 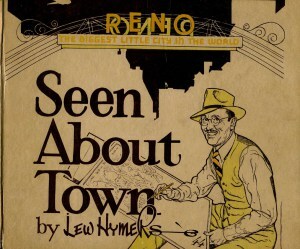 a href=”https://karlbreckenridge.files.wordpress.com/2013/03/hymersstreeter.jpg”> A popular feature of the Nevada State Journal in the 1930s and ’40s was Seen About Town, a collection of caricatures of local movers-and-shakers, drawn rapidly in the lunch counters and legislative halls and wherever they appeared. 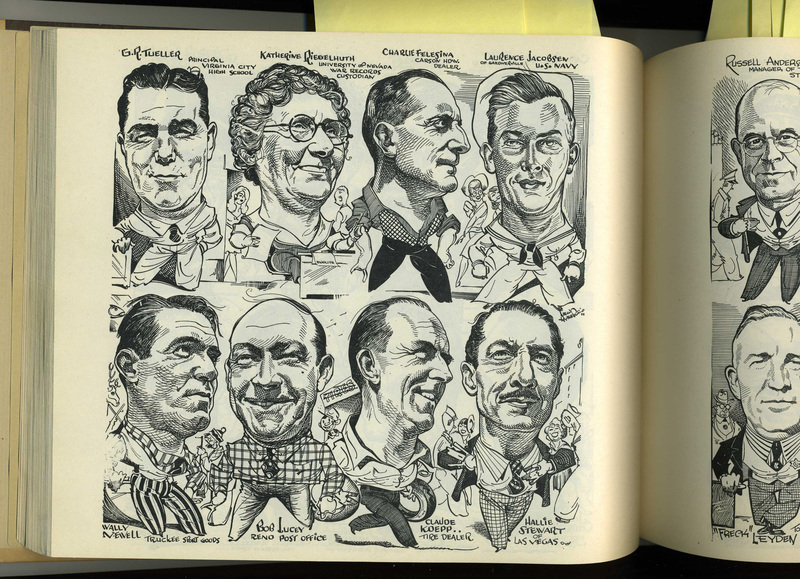 One such was Jack Streeter – Jack’s seen in the bottom row of this montage, second from the right. I was reminded by none other than Buddy Sorensen at a recent convening of the Black Bear Diner Gentlemen’s Coffee & Bear Paw, World Dilemma Solutions & Laudable Opinions Kaffee Klatsch, that if I’m going to go carousing around town on Saturday mornings talking about old markets as we have been on-and-off for the past few years, that I’d darn well better pay some mind to the Ferrari family’s Food Store, and particularly to include the nickname of a popular member of the family. That family member’s name is Bob Ferrari, who graduated from the original Manogue High School by East McCarran Boulevard at its Truckee River crossing, and went on to letter for four years in both baseball and basketball at the University of Nevada. He enlisted in, and later retired from the U. S. Army, then returned to teach at Sparks Middle School and eventually retired also from the school district. He’s now anything but retired in land development – his family recently donated a significant parcel to the Food Bank of Northern Nevada. OK – it’s fine to have a little fun at Bob’s expense and anticipate him walking in to the Coney Island next Monday to a chorus of “Hey, Noodle!” but I owe the family more – the market was one of the stalwarts of our town. It was located in the venerable brick building on the southeast corner of West Second and West Streets, that building itself the subject of a Roy Powers painting in years past. I suspected that the Ferrari family brought their pasta skills from the old country, but learned that no, the family men were railroaders, coming to Reno from Palisade in eastern Nevada. The market was operated by several of Bob’s aunts and uncles and finally taken over by his parents, Ben and Nora. 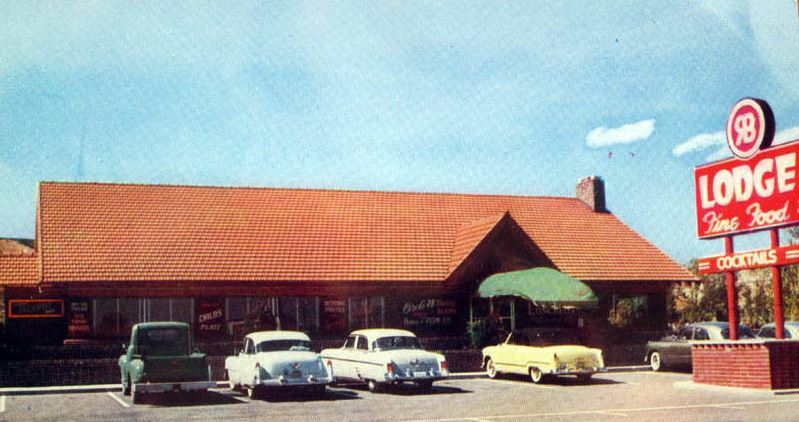 The family all pitched in, Bob and his sister Marilyn, who now operates the family’s motel in Kings Beach, and their younger brother, the late Ben Jr. – all taking their places in the store’s operation while going to school and college. Bob remembers a great grocery trade within the fashionable Colonial Apartments around the corner, delivering there frequently to some shut-in residents. He recalls a small strongbox in the market that had been ignored for many years being opened one last time when the store closed in 1958. In the box were I.O.U.s from many local residents who had fallen victim to the Great Depression, families that the Ferrari family stood behind in a time of need. 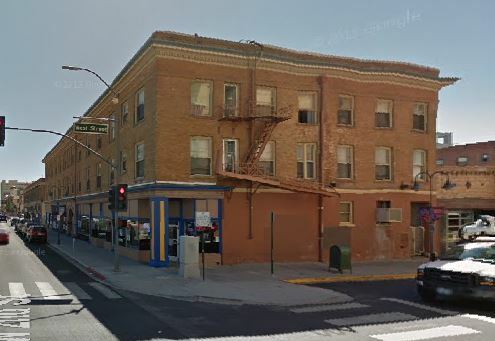 The Food Store was an integral part of early Reno, and I’m glad we finally worked it into a column. Several e-mails asked why I hadn’t included it; the simple reason is that we hadn’t arrived at any downtown mom-and-pop markets yet. I’m glad Buddy got me moving on it, particularly with the nickname angle. 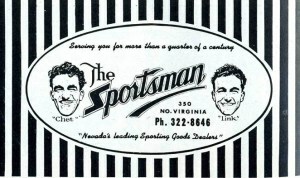 But if you encounter Bob and call him “Noodle,” don’t tell him you read it here – I think he might have boxed a couple of rounds for Coach Jimmy Olivas while at the University, and I have a glass jaw.